Ramon Tamayo from Anchor Brewing joins Steve Jaxon and Mark Carpenter this week on Brew Ha Ha. Herlinda Heras will call in from Puerto Rico too. Ramon grew up in Petaluma and worked at McNear’s Saloon & Dining House in Petaluma. Ken O’Donnell ran it and recommended Ramon so Mark hired him. Ramon started on the packaging line in 2011 and worked his way up into different departments. He was a home brewer before but really learned the craft by studying and working at the brewery. The beer community is tight-knit the those with experience have shared advice with him. He had the idea for a beer called Los Gigantes, made for the SF Giants, with a Mexican-themed label. It was his first project where he did the recipe and the design idea. 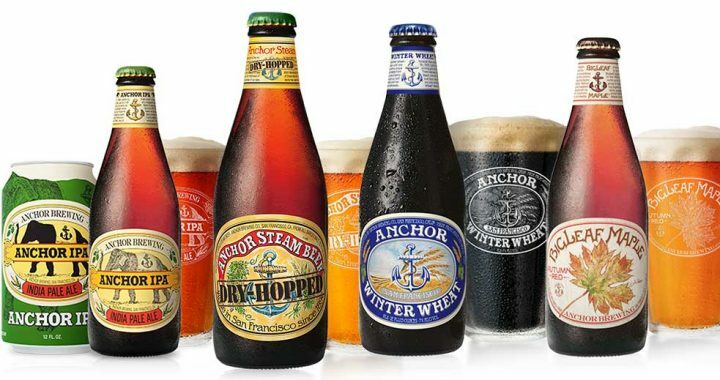 Anchor started as a brand in 1896, which is when the brewery changed its name to Anchor. With Prohibition, the breweries went away but Anchor hung around. Most of the breweries had refrigerators and changed to making ice cream or near beer to survive. But Anchor had no refrigeration. Mark has heard that even during Prohibition, Anchor was still making beer. Fritz Maytag bought Anchor in the 1960s when it was about to close. He drank Anchor beer at The Old Spaghetti Factory in SF. The owner told Fritz to go look at it to see the brewery, which was a real part of California history. Fritz graduated from Stanford and paid a small amount for the brewery, which was dying. The equipment was old and had no refrigeration. The operation was rather basic. Fritz slowly taught himself about beer and hired Mark Carpenter in 1971. They are tasting some Anchor Beer and will imagine tasting it with some parodies of Guy Fieri-style recipes that Steve is reading. Steve Jaxon met Guy Fieri the day before he opened Johnny Garlic’s in 1996. Steve suggests reading Peter Hartlaub’s article in the SF Chronicle about Guy Fieri, which includes quotes from our host Steve Jaxon and producer Mike DeWald. Herlinda is in Puerto Rico with Tara Nurin for Tales of the Cocktail. This was started in New Orleans after Katrina and now they are doing it in Puerto Rico, since Hurricane Maria. Herlinda tells about Puerto Rico’s history and present state. There is great food and drink and the island and beaches are beautiful. She had fritters called frituras. The Surfrider Foundation works cleaning up beaches and collecting data about the dispersion of plastics in the environment. They also took a tour of the Bacardi facilities. Fog Breaker IPA is 6.8% alcohol, which is not too high. This is a new year-round beer from Anchor. Ramon says hazy beer has bad shelf stability. To achieve haziness they use oats or wheat, which makes the beer hazy so you can’t see through the glass. You used to not be able to sell hazy beer. Now, some people like the extra flavors that come with it. The particulate is from proteins in the hops and wheat. They make a few of them because of customer demand. They have a tap room next to the brewery, where they can experiment with new ingredients. They used a special Norwegian farmhouse yeast which ferments hot and fast. One that they have has pineapple and mango flavors. The Anchor pub is open from Noon to 9pm daily, on the corner of Mariposa and De Haro in San Francisco’s Portrero Hill. They have 18 different beers on tap at any one time and about half of them are experimental ones.